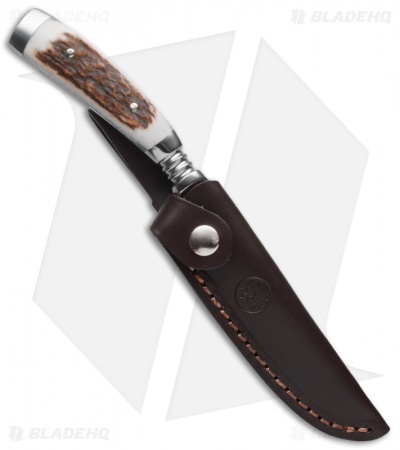 Hunters have often asked Boker for a high quality hunting knife produced in Solingen. So, Boker got together with the Austrian knifemaker Stefan Gobec, and figured out how to improve something good to become even better. The result is a hunting knife in a traditional form. 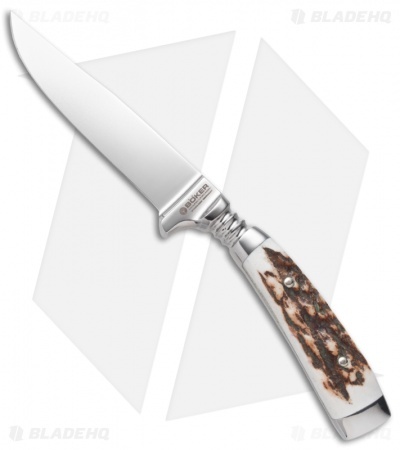 However, Boker has used the proven N690BO stainless steel, which sets standards with its excellent cutting performance in its class. The combination of production and the material gives this full integral nicker maximum stability, without affecting the cutting properties. The flat ground blade is 4.1 mm thick. The clean fitted stag scales sit on a tapered tang, which not only reduces weight but also optimizes balance. The gently sloping handle offers unparalleled ergonomics and terminates with a crown handle, which also serves as a solid and non-slip thumb rest. Comes with slim sheath with detachable belt loop for carry.